The younger generations, because of when they were born, are fundamentally removed by time from the debates of the 1950’s and 1960’s that led to many of the changes in the Church since then. They (including me — I was born just as Generation X was beginning — and I was a Protestant) were not among those arguing for a livelier faith or a more open Church during the years immediately after WWII, Eisenhower, the Bomb, and in the throes of the Cold War. Though anyone can read about those changes, none of us “young ones” can truly experience today what it was like at that time. We have our own zeitgeist, and they had theirs. They had their Merry Pranksters and we have ours. They had their Kennedy’s and Nixons, we have our Clintons and Bushes. They had mimeographs, we have the Internet and social media. They were the Beat Generation and the Me Generation. We are something else — maybe still “beat” and certainly still “me”, but in very different ways. For some reason the generation that came of age in the 1950’s, 1960’s, and into the 1970’s felt a powerful need to strip away the traditions of previous generations. They also had a powerful urge to seek revolution, seen in the riots of 1968 and elsewhere, seen in the sexual and drug revolutions, and even seen in music and clothing. I would argue they tended to throw out the baby with the bath water — which really is a desire not for reform, but for an altogether revolutionary rebirth based on a rejection of what came before and what had been handed down from earlier generations. What was not considered was that throwing the baby out eventually means someone has to go and bring the baby back. To the degree that traditions arise from human needs born out of human nature is the degree to which those traditions still call to us. Throw out the tradition and somehow, somewhere it will find its way back — often more appreciated and understood — because it must. This is (potentially, arguably, maybe) a kind of healthy cycle of purge and rebirth. I’m sure some of the older generation, those who relished the so-called post-Vatican II changes, who lived through those changes and saw them not only as good, but necessary, cringe at the younger generations’ rediscovery of what came before. They may worry that the Church would go backwards instead of progressing forward. This is a fair concern, and those who seek the older traditions should not dismiss the history and arguments of the post-Vatican II era. Neither should the traditionalists be dismissed. Both are on to something and may, in fact, be closer to each other than they think. For the sake of honoring those who have gone before, the younger generations should keep in mind just how worried the older generations might feel if they see all that they fought for being repealed. Recovering what was lost seems to be a growing felt need for many today. I would argue that feeling is much deeper than fashion or trendiness. Rediscovering the great Catholic traditions of the past can seem like an archeological discovery for many — a discovery that resonates within the human soul. This discovery is not at all like the hipsters “discovering” the style of the 1970’s, or thinking they discovered irony. Finding old traditions of worship and liturgy is, rather, like finding a lost world that offers an antidote to what ails your own. It’s not about style or fashion, or adopting a new surface or creating a new appearance. At least it shouldn’t be. But it is important that we don’t bring that old bath water in with the baby. Old is not good merely because it is old. Traditions can be good or bad, and some are interesting but not necessarily critical. Caution is good, because looking to the past can be as much about looking for source material so one can fashion a new style (like the hipster) as it can be about searching out something true. We should be sensitive to the difference. In fact, we shouldn’t really be all that concerned with things old or new, but with truth. That is, the truth about being human, about our nature and our designed need for true worship, the truth about liturgy and dogma, about art and music, about sacred spaces and prayer, and first about our Creator and the Real Presence. If we pursue those things the rest will fall into place (with some effort). The longing in our hearts for beauty, goodness, and truth will grow. 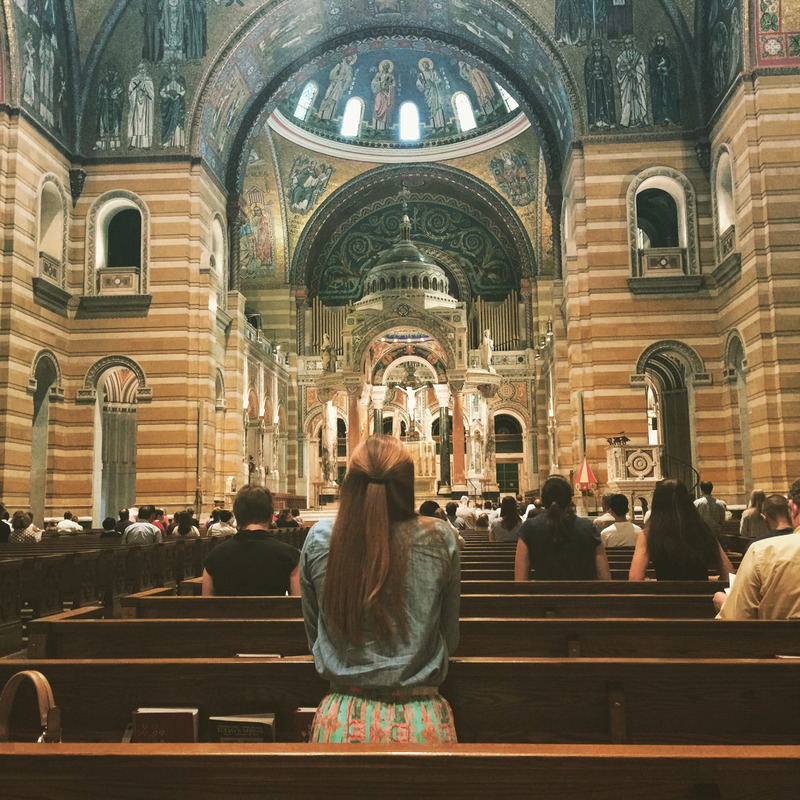 Perhaps that longing is growing in the youth (many are actually not so young anymore), who have realized the modern liturgies that have been presented to them, arising as they have from the past several decades, to be lacking. Why is this important to me? I came into the Church as an adult, having been Protestant for many years. I studied the Church from afar, too cautious I suppose to check it out first hand for a while. So I read about the Church, and I researched online. What I saw was great beauty. I chose Catholicism, in part, because I wanted to get away from the anemic styles and forms of worship I found in evangelical Protestantism. That certainly wasn’t the only reason, or the primary one, but it was important. I thought I would find something that harkened back to the great art and traditions of the past. Then I came into the Church only to find a mixed bag regarding beauty and tradition. When I hear and read about the beauty of the Catholic Church, I want to find it. Beauty can come in many forms and styles. One way is through tradition. AND… Heaven forbid that we would be drawn towards tradition and not to Christ.